In today’s increasingly tech-savvy world, the online presence of your business is of utmost importance. Without generating any web traffic, it’s nearly impossible for a local business to grow, let alone survive. Making sure your website is on point from an SEO standpoint is the #1 way to drive organic traffic to your landing pages. SEO stands for Search Engine Optimization, and it essentially means making your web content easy for Google to understand and categorize. Your website consists of HTML, which search engines like Google, Yahoo and Bing read. Page title – make sure the page title is specific to what your landing page is targeting. Header tags (<h1>, <h2>, <h3>, etc.) – place important keywords inside header tags to show search engines that these topics are the main point of your web page. URL slug (the text in the url that comes after .com. For example: example.com/this-is-the-url-slug) – use keywords that indicate what the landing page is about. Do not use strings of numbers or symbols as they won’t help search engines understand what they can expect to find on your page. Site navigation – your site navigation should be easy to follow, and break down into categories and sub-categories where appropriate. Internal linking – it should be easy to get from one piece of content on your website to another. Search engines use internal links to understand how your pages and content are related, what the site hierarchy is, and general relevance for search queries. Site performance and speed – this is a big one. If elements on your website or landing pages take long to load, Google and other search engines will view your site unfavorably (and so will your visitors… in fact, if a page on your site takes longer than one second to load, visitors are likely to leave before they even see the content). These are just a few of the hundreds of factors that determine SEO performance. WP Hatch offers free SEO audits, which will show you specifically where your website excels with search engines, and where it could use some work. Contact us today for your free SEO audit. Building an email or newsletter list is an important way to not only improve your web traffic, but also to get new sales and customers. Having a robust email list is an easy way to drive traffic to your website, call attention to a new product or piece of content, and to make special offers to people who would otherwise most likely not be visiting your website regularly. Creating an email list is easy. WP Hatch usually uses MailChimp, but there are dozens of other email service providers available at an affordable rate (including Campaign Monitor, Emma, Constant Contact, and many more). Once you’ve created an account with an email service provider, you’ll want to implement an email capture tool on your website. Several new tech companies make this easy for you (we recommend HelloBar or SumoMe). These tools link to your ESP account and implement popups and on-screen messaging that encourages readers to join your email list. As you grow your email list, you can send them friendly reminders about your services, products, web content, and special offers… all pointing back to your website, increasing your web traffic and sales. Did you know that the majority of Internet browsing is now done on smartphones? According to Smart Insights, 51% of digital media consumption is now done on mobile phones, compared to desktop computers (which comes in at just 42%). The crazy thing is that mobile phone Internet browsing is rising drastically, every single day. What this means for you is that your website needs to not just work on mobile phones, but it needs to look great for your visitors. In fact, it’s so important that search engines like Google look at whether websites are mobile-friendly (or “responsive”) as a key SEO factor. If your website is not responsive, you’re missing out on some serious web traffic, and your search rankings are suffering! Slick landing pages are awesome, but a recent web trend for small businesses is to incorporate videos onto websites to describe offerings. You’ve probably seen some already—they’re often animated or sketched drawings that explain the core offerings from a business. The key advantage of explainer videos is that they capture your visitor’s interest, and explain your product or service in a way that is easily digestible. Further, online video consumption is growing at a rapid pace, with many web surfers preferring to take info in the form of a video rather than text. If that’s not enough motivation, videos actually improve SEO for most websites. WP Hatch offers affordable animated explainer videos. Our videos start at just $99 per minute, but act fast: prices are about to go up as demand increases. Social Media is by no means a new trend, but the staggering amount of user engagement continues to surprise industry experts. Mind-boggling social media statistics from BrandWatch.com. Establishing a social media presence is a great way to grow your business. It will allow you to engage with your existing customers and fans, turning them into repeat buyers. Having a strong social media following will also enable you to find a new audience, and convert them into loyal customers. While having a strong social media presence is important for businesses of all sizes, it’s worth noting that not every social media platform makes sense for every business. It’s best to be selective and choose 2-3 social media channels to dive into, and do them well. If you aren’t sure which social media platform makes the most sense for your business, drop us a line! We’d love to help you figure out a social media strategy to grow your business. 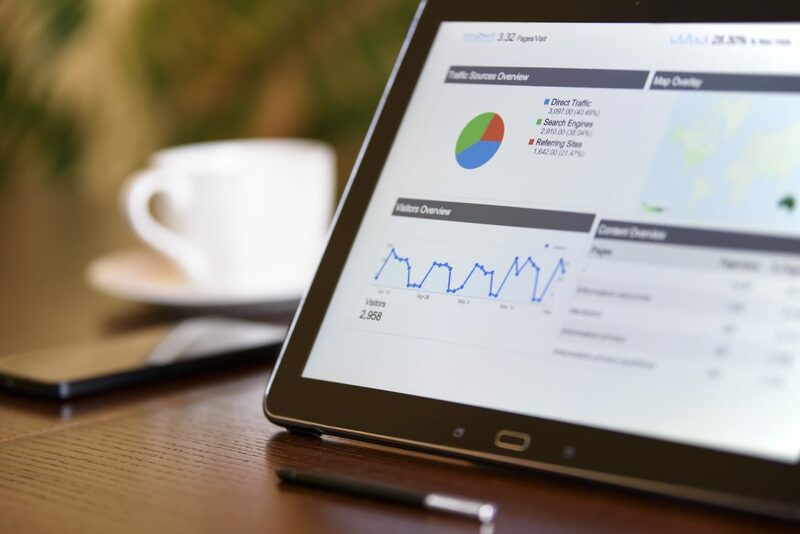 The idea of making proactive changes to a website to increase performance and traffic can be daunting at first, but if you follow the steps above, you will notice significant changes in your web traffic in the following months. And this is just the tip of the iceberg—there are hundreds of more ways for you to improve search rankings, organic traffic, and online presence. Are you on a mission to improve web traffic for your business? What’s working for you? What are your hangups? Let us know in the comments below!